The potato (Solanum tuberosum) is an herbaceous annual that grows up to 100 cm tall and produces a tuber – also called potato – so rich in starch that it ranks as the world’s fourth most important food crop, after maize, wheat and rice. Note: The tubers are eaten, not the leaves or fruit of the plant. As the potato plant grows, its compound leaves manufacture starch that is transferred to the ends of its underground stems (or stolons). The stems thicken to form up to 20 tubers close to the soil surface. 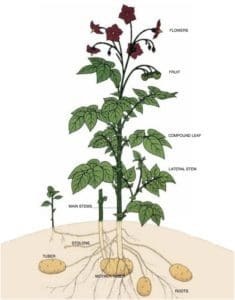 The number of tubers that actually reach maturity depends on available moisture and soil nutrients. Tubers may vary in shape and size, and normally weigh up to 300g each. At the end of the growing season, the plant’s leaves and stems die down to the soil level and its new tubers detach from their stolons. The tubers then serve as a nutrient store that allows the plant to survive the cold and later regrow and reproduce. Each tuber has from two to as many as 10 buds (or ‘eyes’), arranged in a spiral pattern around its surface. The buds generate shoots that grow into new plants when conditions are again favourable.